We often think of superheroes as larger than life. With capes blowing in the wind and biceps bulging at the seams, superheroes are what children's dreams are made of. But many times the superheroes in our lives are children. 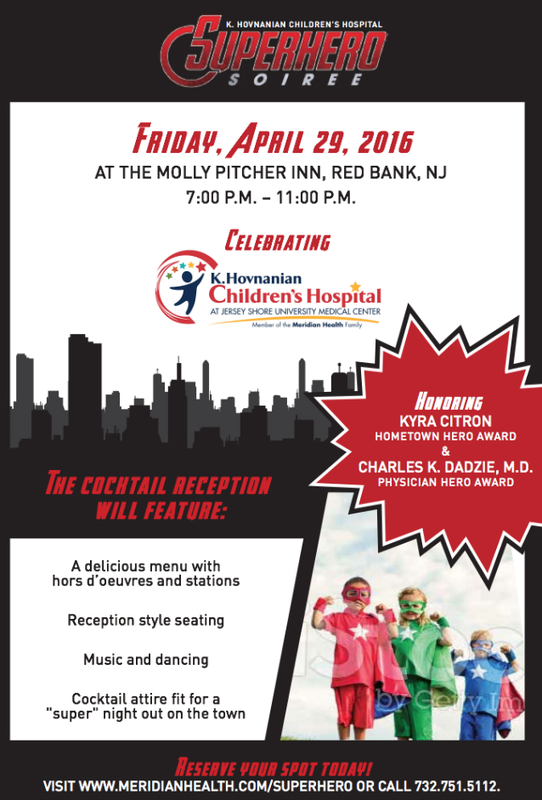 On Friday, April 29th, 2016, K. Hovnanian Children's Hospital will honor our smallest heroes at its annual Superhero Soiree at The Molly Pitcher Inn in Red Bank, New Jersey. This year's honorees are Kyra Citron who will be honored with the Hometown Hero Award and Charles Dadzie, M.D. who will be honored with the Physician Hero Award. The cocktail reception will include a delicious menu with hors d'oeuvres and stations, reception style seating and music and dancing. This year the team at K. Hovnanian Children’s Hospital will be developing a new Pediatric Palliative Care Program for children and their families with chronic illnesses and life-threatening medical conditions. As the parent of a child with type 1 diabetes, I am all too aware of the struggles that come with caring for a child with a chronic illness. Seriously-ill children require care that focuses on treatment of symptoms, pain and stress management, and patient and family support. Their health conditions affect their entire families, who must cope with their young family member's illness and make difficult decisions regarding quality of life. The goal of pediatric palliative care is to add life to the child’s years, not simply years to the child’s life. Just as superheroes fight big battles, no matter how hard or long our young patients battles may be, with strength of will and determination, there is always hope. You can help provide courage to our patients and their families by being a hero for the night to ensure our mission is fulfilled. All monies raised from ticket sales for Superhero Soiree will go towards the new Pediatric Palliative Care Program at K. Hovnanian Children's Hospital. It's sure to be a fun night for a good cause. Hope to see you there! For more information and ticket pricing, click here or visit www.meridianhealth.com/superhero.